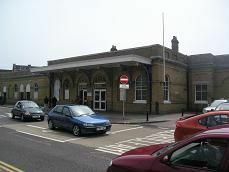 Lowestoft, which is Britain's most easterly town, now only has the one station serving Ipswich and Norwich. The station now looks a bit bare with a large open courtyard. It did have a ticket office, but it was closed due to staff shortages. Our train leaves from platform 2 on time and is full. Norwich trains leave from platform 3. There is no platform 1 for some reason. On leaving Lowestoft we pass a lot of disused sidings on the left and then some factories then the harbour. We then leave the Norwich line on the right and go over a swing bridge before arriving at Oulton Broad South station. It has one platform with the station building that looks disused. A couple of people get on. Soon after leaving we leave Lowestoft behind and enter the Suffolk countryside, passing through lots of trees and the occasional farm. We then go over a level crossing and enter Beccles station, which was once a busy junction, with trains splitting and heading to Great Yarmouth and Lowestoft, and a branch going to Tivetshall on the Great Eastern main line. There is only one platform now, although the other one can still be seen. The station building here is disused. There have been plans approved to construct a passing loop here to allow an hourly service on the line. About six people get off, including a TV crew that must have been filming on the train. After leaving Beccles we again enter the countryside, passing rolling hills and more trees, then some houses appear before we arrive at Brampton, which has a single platform and a simple bus shelter. No one gets on or off. After leaving Brampton we pass through more fields and farms and a few houses and after about 10 minutes we approach Halesworth, passing some lovely looking houses. Halesworth station has two platforms with a building that looks still in use. About four people get on and about the same get off. Leaving Halesworth we pass some factories on the right, then a water treatment plant and a golf course, before entering the countryside. We pass a few houses dotted around, and after a few minutes we stop at Darsham, which has two platforms with a couple of brick shelters. One person gets on. Leaving Darsham we enter more woodland and continue towards Saxmundham. Shortly before we arrive we pass the disused branch to Adleburgh, which is still in use as far as Leiston for nuclear flask trains from Sizewell. Another train passes us as we enter Saxmundham station, which has two platforms, with the station building still in use. Quite a few people get on and off here. At the moment there are trains that only run as far as here from Ipswich, but this will change when the passing loop at Beccles is complete. On leaving Saxmundham we pass through more farmland passing, a few houses and a church until we reach Wickham Market station. This was once the junction for the branch to Framingham. It has only one platform, although the other one can still be seen. The station building is privately owned one person gets off. The landscape becomes hillier now as we pass more farms and quite a few newly planted trees. We then stop at Melton, which has one platform but again a disused platform can be seen. The station building here is now a café and three people get on the train. There are a load of factories and warehouses surround the station. Leaving Melton there are a mixture of modern flats and old houses and a park with plenty of boats on the river, which shows this is a popular area to live with connections to Ipswich not far away and in some pleasant scenery. We then arrive at Woodbridge which is near Sutton Hoo Saxon burial site. The station has two platforms and a station building, which I am not sure if it is in use. Still quite a few people get on and off. There is another train bound for Saxmundham on the other platform. As you leave Woodbridge you get a great view of the river and the valley, passing more farms and houses and what looks like an old station. We continue through a valley with quite a few houses on right, before meeting up with the Felixstowe branch line, before arriving at Westerfield station. It has two platforms with simple bus shelters on both. One person gets off and we continue through some countryside, before we start to enter Ipswich on a viaduct over the town and the river Orwell, before meeting up with the Great Eastern mainline, before arriving into Ipswich station bang on time.